I just finished reading the book Skill Up: A Software Developer's Guide to Life and Career by Jordan Hudgens. 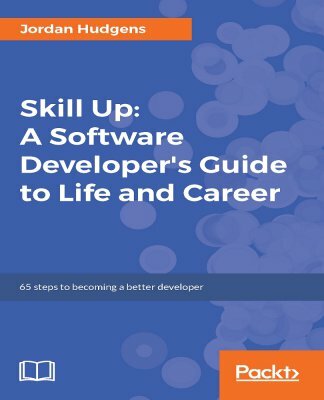 This unique book provides you with a wealth of tips, tricks, best practices, and answers to the day-to-day questions that programmers face in their careers. It is split into three parts: Coder Skills, Freelancer Skills, and Career Skills, providing the knowledge you need to get ahead in programming. When your working on something hard or are learning something new, remove any and all potential distractions, limiting the slot to around two hours. Deep work is the ability to focus without distraction on a demanding task. A Research from about task-switching shows that it takes, on average, 23 minutes and 15 seconds to get fully back on task after being distracted. Keep focused! Set small goals, you're less likely to put it off. To think about the new concept instead of rushing through it. Use services like HARO to pair up with reporters and have your name out there. Recruit other developers if you're working on something that's not in your domain of expertise. Blogging is a great way to position yourself as an expert. Try to avoid scope creep. Basecamp and Freshbooks can be valuable tools for freelancers and entrepreneurs. How to engage new clients. LinkedIn and good old referrals are still strong networking tools, don't ignore them. If you should learn how to code and how to learn from scratch. What specialty should you take. Bootcamps and other ways to improve your programming skills. This book has tips for everyone. Don't forget that the life of a developer and/or entrepreneur is not easy. Coding is hard! Keeping up to date with libraries and techniques is hard! Dealing with clients is hard! So what can we do to keep up to date with all facets of our profession? I personally enjoyed this book because some of the techniques/tips introduced here I was already using on my life (pomodoro technique, deep work, task switching, etc) and are things I always try to pass to my fellow developers when I can. Plus, the career tips on Part III were very insightful too. Hope it has something that you're looking for too!